There have been several light snow events so far this season. While none of the events have been anything to write home about (unless you played bumper cars on Monday AM) this is a sharp departure from the last two years. Last year we set up a flamethrower that lasted most of the month (peaking with 70 degree weather on Christmas Eve!) with very little snow. We finished with below average snow for the entire winter. Our course the same thing happened in 2014-15 and we ended up with record snow which proves that you cannot use one month to judge what winter will be like. Let's take a look at some of the December snow numbers. On average each of the major Southern New England climate sites receives 1-2 plow-able snow events each December. That has not been the case in the last 2 December's after a fairly busy stretch (minus 2011!). I was in college for the 2007-2010 winters and that was awesome. Snowball fights broke out between rival dorms and the snow was a great place to hide beers from RA's (and keep them cold). I was never more popular then before a snowstorm from 2007-2011 (until now- thanks to all my readers!). But why the drastic flip? First of all it was colder from 2007-2010 in December. Now here is 2011-2015. Just a tad warmer. 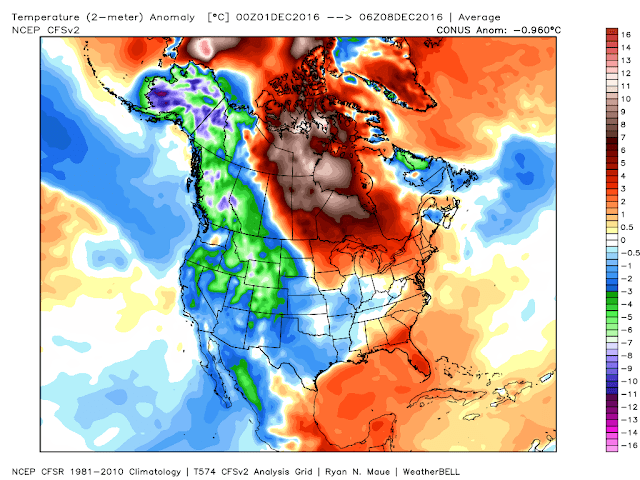 We have been much warmer the past 5 Decembers. Is this El Nino, La Nina or climate change? Or is it simply a product of the natural cycle? The answer is all of the above. I do think the last 5 years would be warm with or without human aided climate chang. I also think we were a bit warmer then we would have been without human interference. That said even with the human influence it was plenty cold from 2007-2010 so there has to be a natural force at work as well. The first place to look is the Pacific Ocean. Here is the early December sea surface temperature anomaly chart 07-10. First thing to notice is all the blue in the North Pacific Ocean, especially near the Gulf of Alaska. This is colder than average water. Next notice that in 2007, 2008 and 2010 all the blue near the equator. This is a feature of a La Nina. The 2007-08 and 2010-11 events were moderate to strong while the 08-09 event was more neutral. 2009-10 feature an El Nino but notice how the warm water (orange/red) stretches towards the Central Pacific. In climatology these features help to contribute to a cold/snow pattern in the North/East US. Notice how the North Pacific steadily warms over the years and how above average sea surface temps take over the Pacific basin. 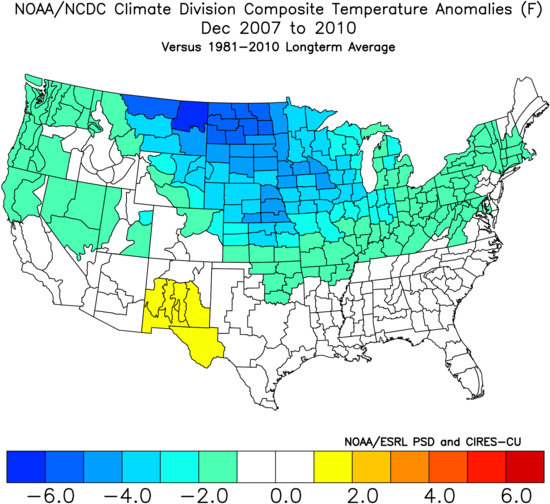 These SSTA do not mean a warm winter as 2013-14 and 2014-15 were both blockbuster winters in terms of snow and cold in the Northeast. But it does take some time when the Pacific boils. 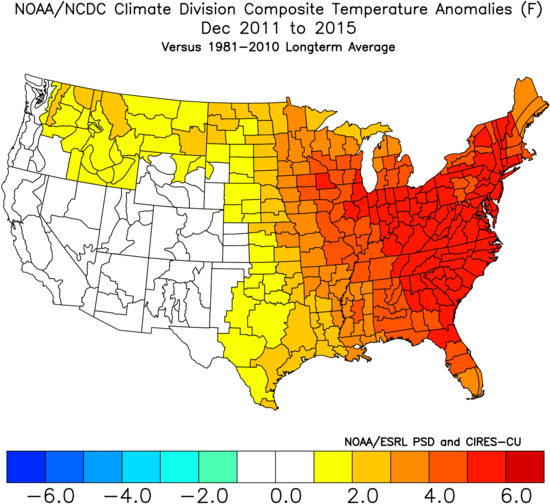 Look at how warm 2015 is compared to 2009 (both El Nino's) and its no wonder that it was so warm last December. 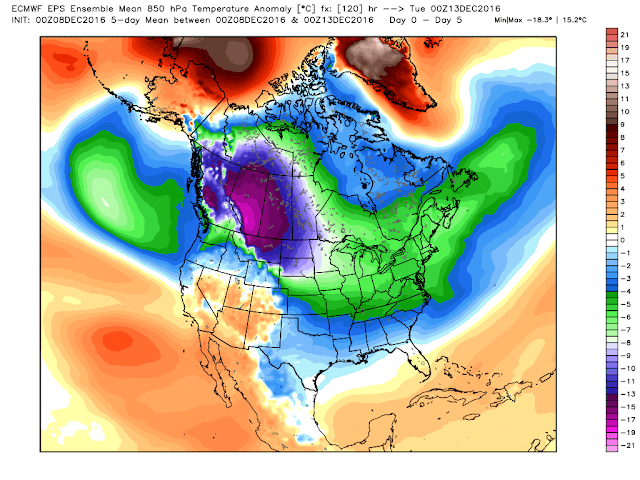 So that was a bit technical but the point is the Pacific flipped into a warm mode the past few years and December snow has gone down as a result. So what does 2016 look like? 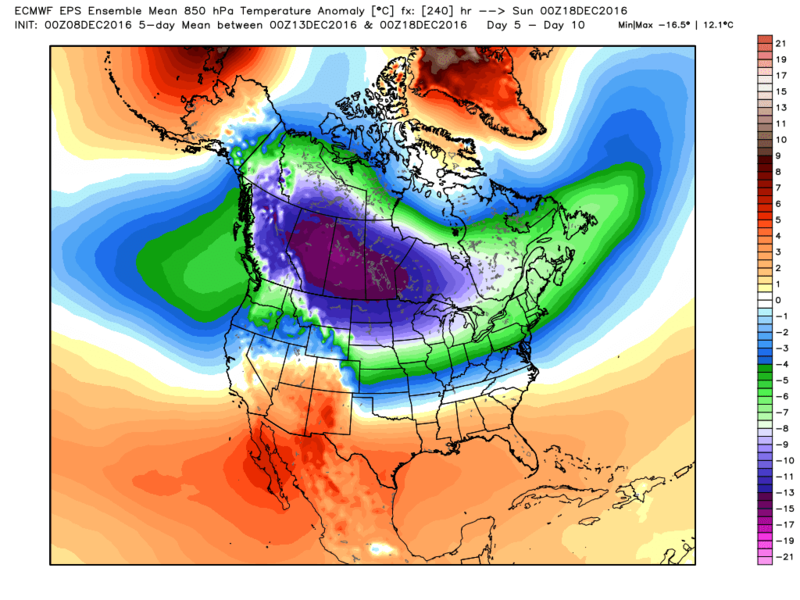 We see a cold pool returning to the Gulf of Alaska and a weak La Nina signal near the equator. One would expect some snow this December. So how does the long range forecast compare to our quick analysis? So far December has been cold in the west, warm in the Great Lakes, and a few degrees above average in the east. You have to have the cold to have the snow. One usually follows the other. The ten day snow charts believe we will go over our monthly averages for December. The first chance is Sunday night-Monday which I am watching but there will be plenty more after that. It was a lot of fun playing football outside in t-shirts the past 2 Christmas Day's but I will trade that for a snowstorm on the holiday how about you?